RUSH: Here is that story from The Daily Caller: “Trump: We Will Guard Our Border With Our Military.” Here’s a Trump tweet. “As ridiculous as it sounds, the laws of our country do not easily allow us to send those crossing our border back,” again, if they come from Honduras, anywhere outside Mexico. There is that loophole. They get to stay if they come from anywhere besides Mexico or Canada, essentially, here in the southern hemisphere. So, you know, as I say, Trump was getting lax on this, a lot of his supporter thought he was getting lax on this, distracted, maybe, by other things. He’s heard about that and is now doubling down once again on this. It’s good because this is why he got elected. I mean, there are other reasons, too, but this is top of the list. “President Donald Trump said Tuesday that the US military will be used to guard the US-Mexico border. ‘We are going to be guarding our border with our military. That’s a big step,’ Trump told reporters gathered at the White House. ‘We cannot have people flowing into our country illegally, disappearing, and by the way never showing up for court. '” Which is exactly what happened when the Obama administration took these people. 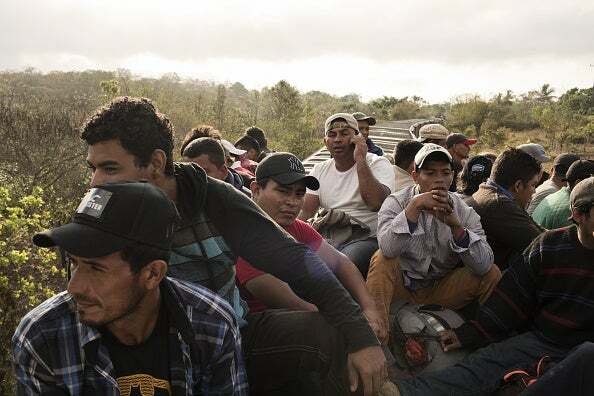 The minute they crossed the border, he put ’em on buses and dispersed them, I mean, they held them maybe for a couple of days and then found leftist families that would be willing to accept them all over the country. We don’t know how many make up this number of illegals. “The President’s comments appear to take aim at current US policy which requires border agents to catch then release family units who arrive at the border from noncontiguous countries.” Did everybody hear that? Noncontiguous countries. “He also said he had spoken with Secretary of Defense James Mattis about the use of the military to guard the border.” So Trump’s fit to be tied over this caravan, if his tweets are any indication. RUSH: Let’s hit the phones. We’re gonna start here, since I didn’t get to any phones in the first hour I want to make it up to you by getting to the phones in the monologue segment of this hour. And we’re gonna start in Boynton Beach, Florida, right down the road here. This is Bill. Bill, great to have you! Glad you called. CALLER: Thanks, Rush. Thirty-year plank owner and a Dittohead for that long. RUSH: Well, thank you, sir. I appreciate it. CALLER: No problem. Okay. So you kind of took my thunder. RUSH: Don’t tell me you were gonna talk about condom snorting? Please. No, no. CALLER: No. I never even thought of such a thing. CALLER: It was just the loophole be damned, is what I say. You know, sorry. If we can’t put our troops on the border to keep these people from crossing, then let the state militias step up and stand the post. That’s where we need to be. This has gotta stop. RUSH: It does have to stop. And it’s not because there’s bigotry or racism or any of that. It’s simply about sovereignty. It’s about maintaining who we are. It’s about protecting what is ours. This is not a caravan, and it’s not immigration. This is an invasion. RUSH: It’s exactly right. It’s an invasion. And it’s an invasion that is with a specific negative objective, as far as the United States is concerned. You’re absolutely right. Well, what do you think, Trump says he’s gonna take the military down there, he talked to Mattis about it. CALLER: Well, that’s his job. That’s exactly what he should be doing. My first comment when I first heard about this so-called caravan was Trump needs to step up and put the military on the border. If it means man side by side, you know, dressed right and armed and standing by and if somebody wants — ’cause that’s what that test was last week when they had to dance around the border guard, you remember that? CALLER: When they had about 150 people or something like that pushing the border? And that was that was all about, a test to see what they could get away with. And now they’re bringing 1,500, by the time they get here, it will be 3,000. RUSH: No. No, no, no, no. It’s 5,000 from the get-go. They’re in the process trying to break it up and make it look like Mexico is stopping the caravan. They’re not stopping anything. They’re breaking it up into smaller groups to make it appear to be not as big a target and to create the illusion that it’s slowing down. CALLER: You break it up and you got 15 different targets now. You got, you know, one in San Diego, one in Juarez, you know, one in Brownsville. That’s a lot of work to keep up with. RUSH: No question about it. Well, the loophole, by the way, does not say that if they reach the border they have to be admitted. The loophole says that if they cross the border, if they succeed in crossing the border, they can’t be deported. CALLER: Well, remember they had the Border Patrol said they couldn’t get any closer than 12 miles to the border? ‘Cause now they’re in country, boom, they’re free to stay. RUSH: Yep. Exactly. Well, let’s see what Trump does. We’ll see how this actually manifests. CALLER: I got faith in him. That’s the key. I got faith in him. I know that’s what he needs to do and he knows that’s what he needs to do. RUSH: Is this the primary reason you voted for him? CALLER: No. I voted for him because I could not put anybody with a D in front of them. I almost had a hard time voting for him, but believe me, this was the best thing we ever did was to save our country was to put him in office. RUSH: So you’ve had a change of heart about Trump, you’re now more proactive for Trump than you were when you voted? CALLER: Somehow I lost you. RUSH: No, you’re still there. Are you still there? Testing, one, two, Bill in Boynton Beach, are you there? Well, he either doesn’t want to answer the question or can’t hear me any longer. My guess is, you heard him, he said that his vote was primarily against anybody with a D, and that left Trump. And I asked him if he’s become more proactive for Trump since the election. My guess is that he has, but I don’t want to put words in his mouth. RUSH: Back to the phones we go. St. Louis. It’s Joe. It’s great to have you. Welcome, sir. Great to have you with us. CALLER: Hey, Rush, 30-year Millennial dittos. I’ve been a Rush baby my whole life. RUSH: I appreciate that. Folks, I have to tell you. Doing this 30 years, 29 years, it’s a long time, but to discover — and I know it’s true because of the audience figures, people have been listening for that long too. I mean, it is incredible. And I’m so appreciative of it. I don’t take it for granted a single day, when I hear about people 30 years here, I swell with pride over it. I’m glad you mentioned it. Thank you. And I find it so ironic considering the outspoken nature they’ve been about America immigration policy (unintelligible) over there, they’re wonderful people that enrich our lives in the United States. It really sounds to me like they need to build a wall on the southern border of Mexico, or they have a racist problem, that Mexico doesn’t like brown people. It seems to be that’s part of the issue here. RUSH: I’m having real trouble understanding you because of the quality of your cell call. You think Mexico should build a wall on their southern border to keep people from Central and South America out? Is that what you said? CALLER: Well, what I’m really saying is that it’s ironic that Mexico — ’cause it says in the BuzzFeed article that Mexico has basically taken a hard-nosed position on this, that under no circumstance will the government of Mexico promote irregular migration. And it says just the next line over that Mexico has been detaining and deporting thousands of migrants for years. In fact, it says (unintelligible) people that they’ve been deporting. RUSH: That happens to be true. But that’s only if they are seeking to stay in Mexico. Mexico acts as a pass-through if they are headed to the United States. It’s true to the extent that Mexico will refuse permission to any southern migrant seeking to stay there. Mexico is exporting people. I don’t care what they say and I don’t care who you listen to talk about it, the Mexicans do have a plan, the Mexican government. They have been in favor of illegal immigration to the United States. They’ve been in favor of the United States being forced to pay welfare benefits, health care, education, to illegal immigrants. Hey, the Mexicans aren’t stupid. If there’s a country to the north that will take its human debris, why not get rid of ’em. Mexico’s got enough problems as it is. And so if some Mexicans to want flee to go to the United States, the Mexican governor supports this very, very subtly when Trump is in the White House. When Obama’s there, it was a combined effort. But the reverse is not true. You can’t get into Mexico anywhere near as easily as Mexicans can get into the United States. Now, you find the BuzzFeed article ironic because you say that it contains quotes from Mexican interior officials where they shut down migration. But again, that’s true if these migrates want to stay in Mexico. But let’s just reread what the embedded BuzzFeed reporter, who’s in the caravan, his name is Adolfo Flores, and he’s quoting one of the leaders who’s saying that Mexico is not stopping them. Mexico’s not stopping us. Mexico’s helping us. Mexico is aiding and abetting us. They’re taking the caravan, think of it as 5,000 people in a giant line. That’s not a good picture. So you break it up. You make it look like it’s falling apart, you make it look like it’s disbanding, when it isn’t. One group of 5,000 is becoming many smaller groups. And those groups don’t look anywhere near as large and therefore anywhere near as powerful or committed. And Mexico, according to Adolfo Flores, is not doing anything to stop it. Gina Garibo, one of the organizers of the caravan, denied the caravan was over. “We have to follow through with our promise to help people gain asylum in the U.S. or Mexico. Migrants would condition moving but in smaller groups than the caravan.” And Mexico is gonna pave the road for them, as long as they don’t stop in Mexico. Mexico is tough as hell. This caravan is an annual event about this time every year, and it’s largely kids. Not exclusively and not totally, but largely kids, by design. And they get to Mexico on trains. Their ultimate objective is the United States, where, if they get in, they have asylum, because they’re not from Mexico. U.S. law, a loophole, grants them asylum. The Obama administration was willingly accepting them and dispersing them all over the country. Remember, these are future Democrat voters. These are future dependents. These are future people living in this country who need to be taken care of. The Democrat Party wants to be seen as the party of government doing that for them. It’s all about voter registration. And hell, maybe not even that. It’s just all about quickly amassing new voters so that they can maintain their permanent underclass, which the Democrat Party needs. I appreciate the call. RUSH: We have some audio from President Trump moments ago this afternoon at the White House. It was working lunch with leaders of Estonia, Latvia, and Lithuania, and the president let the media in at the beginning. And this is what he said about the border. THE PRESIDENT: We have very bad laws for our border, and we are going to be doing some things, I’ve been speaking with General Mattis, we’re gonna doing things militarily. Until we can have a wall and proper security, we’re gonna be guarding our border with the military. That’s a big step. We really haven’t done that before, or certainly not very much before. RUSH: And the caravan is next, and the president said that it makes him sad. THE PRESIDENT: No, the caravan doesn’t irritate me. The caravan makes me very sad that this can happen to the United States. We have thousands of people that decide to just walk into our country, and we don’t have any laws that can protect it. And the wall, because of the Democrats, has been delayed, but it’s very sad to see it, and sad even for both sides. It’s sad for the people in the caravan, and it’s sad for the people of the United States. It’s really sad that we don’t have laws that say we have a border, and if you don’t do it legally, you can’t come into the United States. To me, that’s a very sad thing for the people of the United States. RUSH: And once again, referring to the loophole there that permits — I used to know the history of why this loophole’s there. I guarantee you it’s related to Democrat immigration law because they’re the people that have written the modern incarnation of it. You know, we didn’t have much immigration at all from 1920 to ’65. I mean, it was less than a hundred thousand people were legally admitted to the country. Then we revised immigration law in 1965 with Ted Kennedy, and that led to an amnesty in 1986 that was granted to 2.9 million illegal immigrants. And Ronald Reagan signed that on the basis that it was never gonna happen again. We’re gonna have border security and this would be the last time that we ever have to grant amnesty to illegals. Now the number tossed around is 12 million illegal. But I don’t think that’s right. I’ll bet you that we’re easily at 20. Twenty million used to be the number until Obama got into office and it magically became 12 million. But we don’t really know because they’ve all been in the shadows, according to Democrat language. I think the number is 20 million or maybe higher. And the Democrats do not want that number known. Twelve million and comprehensive immigration reform, i.e., amnesty, 12 million? Well, they might be able to get enough Americans with a sense of compassion, go along with that. Although they’re having all kinds of trouble. They have not been able to get the votes for comprehensive immigration reform ever. Not since 1986. If that number is actually documented to be 20 or 25, even 30 million, then they can kiss it good-bye. But somewhere this loophole ended up in existence. And that’s what Trump is talking about. And again, it basically says that if you are seeking entry to the United States from anywhere in central or South America, other than Mexico, if you get here, you’re allowed to stay. If you come from Mexico or from Canada, you can be deported simply on the basis that you’re here illegally. 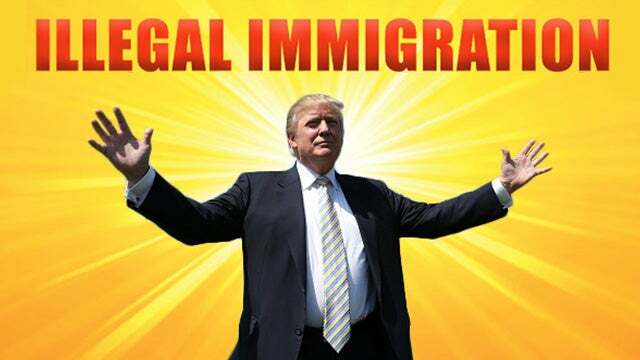 But if you’re here illegally from Central America, then you can stay until you have an asylum hearing or until a Democrat administration doesn’t even want you to go through an asylum hearing and they just grant you status and move you into a home of compassionate Democrats where you’re allowed to grow up essentially not as a citizen, but you’re on your way. Loophole, there’s a reason for it, and I think I knew at one time and I just don’t recall it. RUSH: This is Amir in Salt Lake City. It’s great to have you on the program. Hi. CALLER: Nice talking to you, Rush. I’m an immigrant and I’ve been here 19 years. And I can tell you one thing. American people are uninformed how immigration works. We applied and waited for 19 months as immigrants in another country to get to the interview in U.S. embassy. After we got interview, we wait five months to schedule our tickets and plane to fly over here. That’s how it works. RUSH: Where did you wait those 19 months? RUSH: Where? Were you in America? CALLER: In Germany. Germany. We were refugees in Germany from Bosnia. RUSH: So you had to wait those 19 months after you applied in Germany; you weren’t even in the country? RUSH: Hey, look, I’m not trying to be flippant. I’m really not. Did you ever consider at one time to heck with all this and go into Mexico and just try to get in that way? CALLER: I don’t even want to move back to Bosnia, sir. I don’t care about not even my own country. I’m staying here forever. CALLER: From the beginning. From the beginning, sir, because we were tired. We were given 24 hours to leave Germany. They gave us 24 hours when my wife was eight months pregnant, and we had a two years old. RUSH: Okay. So here is right there the essence of immigration. Right there is it. That’s the essence. That’s legal immigration. Anyway, I’m glad you got through. I really am. I’m sad we’re out of time here, but we are. I have to go. Back after this. RUSH: Okay. That’s it for the second busy broadcast hour today, the Rush Limbaugh program and the EIB Network. And, of course, much more straight ahead as the Democrats are trying to block any additional border security improvements. RUSH: Here’s Keith in Bluffton, South Carolina. Hi. You’re next. CALLER: Hi, Rush. Mexico allowing an invasion is akin to an act of war, in my mind. If Mexico won’t acknowledge our sovereignty we should be proactive and occupy five miles of Mexican turf to establish an immigration buffer zone. If we are turn back the movement on Mexican soil, then we don’t have to worry about having to put the illegals up. RUSH: Okay, wait a second, now. Let’s actually envision this. The U.S. military would have to invade Mexico and then occupy what you’re calling a Gaza Strip type area. CALLER: Yeah. Use that $1.6 billion for fencing that we got in the budget for razor wire so we can intercept them on Mexican soil instead of our own. RUSH: No, I get that. I actually want to see what happens after this invasion takes place. I remember when U.S. troops landed on the beach in Mogadishu, Dan Rather and the media had checked into their hotels a day earlier and were there to greet them. I mean, news people with their cameras on the beach as the uniformed military rolled ashore on the way to get rid of the Sahib Skyhook out of Mogadishu in Somalia. And I’m trying to envision this. The military deploys from somewhere and sets up a Gaza Strip line, we actually invade and occupy mileage, square footage of Mexico, we set up a border checkpoint. And what do the Mexicans do, Keith, after we do this? CALLER: I don’t know that they have much to answer with. RUSH: You know, it’s fascinating to picture this, I have to admit. What would the Mexicans do? THE PRESIDENT: The Mexican border is very unprotected by our laws. We have horrible, horrible and very unsafe laws in the United States. And we’re going to be able to do something about that, hopefully, soon. Hopefully, Congress will get their act together and get in and create some very powerful laws — like Mexico has, and like Canada has, and like almost all countries have. We don’t have laws. We have “catch-and-release.” You catch and then you immediately release, and people come back years later for a court case. Except they virtually never come back. So we are preparing for the military to secure our border between Mexico and the United States. We have a meeting on it in a little while with General Mattis and everybody, and I think that it’s something we have to do. RUSH: Holy smokes! Can you imagine what they’re doing in the swamp after hearing that? I mean, it was one thing to have it in The Daily Caller website, but here’s the president saying it. And he’s gonna meet with Mad Dog Mattis after the press conference with the Latvians, the Estonians and the Lithuanians, and they’re gonna discuss doing it! And we just had a caller who thinks what we ought to do is send the U.S. military across the border and occupy a square-mileage area of Mexico that actually becomes our new temporary checkpoint border where we stop ’em even before they get to the real border and make the Mexicans stop us. THE PRESIDENT: Now, the caravan, which is over a thousand people coming in from Honduras thought they were gonna just walk right through Mexico and right through the border. As you know, NAFTA is a phenomenal deal for Mexico; it’s been a horrible deal for the United States. We’re renegotiating it now, and I told Mexico yesterday that because of the fact that their laws are so strong, they can do things about it that — hard to believe — the United States can’t. I said, “I hope you’re gonna tell that caravan not to get up to the border,” and I think they’re doing that, because as of 12 minutes ago, it was all being broken up. We’ll see what happens. RUSH: Yeah, yeah, yeah. But Mr. President, BuzzFeed’s got a reporter embedded here, Adolfo Flores, and he’s been saying he’s been talking to some leaders down there. They’re not stopping. They are breaking it up to make it look like it’s sort of breaking up and disbanding, going in different directions, but the people involved in this thing say they’re not stopping. So we’ll see. I can understand if Trump doesn’t want to believe BuzzFeed. They’re the first people that published the dossier. But that’s what they say.